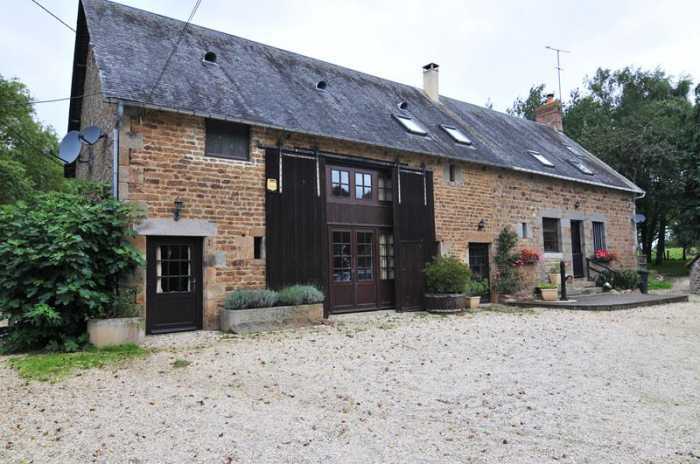 Properties for sale in Normandy, France - AHIN-SP-00935 Nr Passais-la-Conception 61350 Substantial detached 4 bedroomed family house with no neighbours, outbuildings and nearly 2 acres of gardens. AHIN-SP-00935 Nr Passais-la-Conception 61350 Substantial detached 4 bedroomed family house with no neighbours, outbuildings and nearly 2 acres of gardens. AHIN-SP-00935 Near Passais-la-Conception 61350 Substantial detached 4 bedroomed family house with no neighbours, outbuildings and nearly 2 acres of gardens. The property has been completely renovated whilst retaining the character features and boasts a superb farmhouse kitchen. It stands in a private position surrounded by its own land with several well-maintained stone outbuildings. It benefits from double glazed windows throughout, a recently fitted kitchen with granite worktops, the stone work has been repointed and doors and windows in the outbuildings have also been replaced. Viewing is highly recommended. The property is situated in the south of the Orne department of Normandy 6km away from a bustling village with bakery, small supermarket, two banks, tabac, pharmacy, butchers, bar/restaurant, hardware shop, book shop, post office, art gallery, hairdressers and electrical shop. It is 19km from the medieval town of Domfront, 9.5km north of the major town of Gorron and 13km from Ambrières-les-Vallées. The UNESCO heritage site of Mont Saint Michel and the beaches are about 64km from the property. The ferry port of Caen Ouistreham is about a 90 minute drive, as is Saint Malo. The ferry ports of Cherbourg Octeville and Le Havre are about two and a half hours away and Calais is approximately 4 hours by car. The nearest airports are at Rennes (1 hour) or Dinard (1.5 hours). Entrance Hall 4.62 x 3.75m Partly glazed “stable type” door and window to front elevation. Tiled floor. Stairs to first floor with cupboard under. Exposed beams. Radiator. Exposed stone walls. Bathroom 3.60 x 2.13m Tiled floor. Bath with mixer tap/shower fitment and tiled surround. Vanity unit. Shower. WC. Part wood panelled walls. Window to rear elevation. Radiator. Utility/Boiler Room 2.86 x 2.43m Partly glazed door to rear elevation. Space and plumbing for washing machine. Vent. Tumble dryer. Boiler. Exposed stone walls. Matching base and wall units. Worktops and tiled splash-backs. Tiled floor. Electrics. “L” shaped Lounge 6.37 x 3.98m and 3.48 x 2.60m Partly glazed double doors and 2 windows to front and window to rear elevations. Exposed beams and stone wall. 2 radiators. Gas fired “wood-burner”. Cupboard housing fuse board. Kitchen/Dining Room 8.88 x 6.75m Handmade oak kitchen (3 years old) with granite worktops. Built-in wine rack. Base units. Display wall units. Space for upright fridge/freezer. Exposed stone wall and beams. Double ceramic sink with mixer tap. Space for range style cooker. 2 telephone sockets. 3 windows and partly glazed door to front and glazed double doors to rear elevations. 3 radiators. Tiled floor. Fireplace with raised hearth. Landing Window and 2 Velux windows to front elevation. Exposed beams and stone wall. Hatch to loft with drop down ladder. Gallery Landing Exposed stone wall and beams. Dressing Area 2.39 x 2.02m Velux window to front elevation. Built-in wardrobes to one wall. Wood flooring. Mezzanine Storage over. En-Suite Shower Room 3.72 x 2.27m Velux window to rear elevation. Wood flooring. WC. Towel heater. Inset spotlights. Twin vanity unit with mirror and light over. Large shower. Bedroom 2 3.48 x 3.22m Window to front elevation. Radiator. Exposed stone wall and beams. Bedroom 3 4.14 x 3.14m Exposed stone wall and beams. Window to rear elevation. Radiator. Shower Room 3.06 x 2.30m Velux window to rear elevation. Laminate flooring. WC. Pedestal basin. Partly tiled walls/. Shower. Radiator. Bedroom 4 3.47 x 3.40m Window to rear elevation. Laminate flooring. Exposed stone wall. Radiator. Built-in cupboard. Double wooden gates open on to a gravelled courtyard. Lawn. Mature trees including walnut tree. Fresh water pond. Decking area. Orchard/Small Paddock including over 350 assorted trees including 2 fig, cherry, apricot, peach, plum, and apple. Soft fruit including blackcurrants and sloe. To the rear of the house is a covered decking area. Studio (ideal to convert to Gite/Games Room) 6.85 x 4.95m 2 skylights. Concrete floor. Sliding door to front elevation. Water and electricity connected. Outside lights. Gravel courtyard. Post and rail fencing with grillage (dog prof). Separate Detached Timber and Cob Garage 9.68 x 6.55m Corrugated iron roof. Sliding door to front elevation. Power and light. Separate Stone Barn 7.07 x 4.69m Tiled roof. (new windows and doors and repointed) Tiled roof. Door and window to front elevation. Concrete floor. Power and light. First floor storage area over. Attached shed to the rear. Attached to the end of the house is timber chicken shed and old stable 4.68 x 3.92m. Attached Pig Sty to the side. Shed with oil storage tank. Kennels 6.11 x 5.22m Window and partly glazed door to front and window to rear elevations. Divided into 4 kennels. Tiled floor and partly tiled walls. Exposed beams. The property has mains water, electricity and telephone. Remote controlled oil fired central heating and 2 woodburners. Drainage is to an all water septic tank. Broadband internet connection. Security alarm.